Steering and suspension on these trucks are pretty loose. The older they get the worse they perform because the various components wear out. 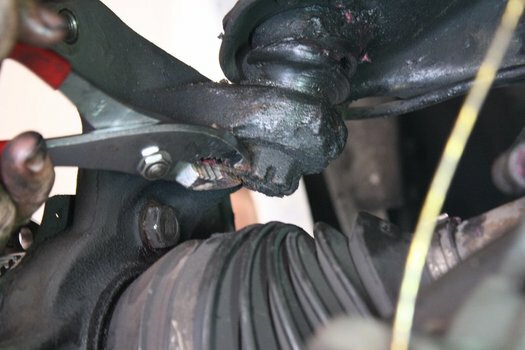 If you have a high performance truck or just want get the steering up to snuff, you're going to end up replacing ball joints at one point or another. This article covers Chevrolet S10, Blazer, GMC S15 Sonoma, Jimmy, Syclone, Typhoon, and Oldsmobile Bravada 4 wheel drive trucks. The 2 wheel drive trucks are nearly identical when it comes to ball joints, but the part numbers and suspension will look a little different. Safely lift the truck off the ground using jacks and a jack stands or a vehicle lift. NEVER get under a vehicle that is only lifted using a jack. Jack stands are a requirement for your safety. Being crushed under your car is the dumbest thing that can happen to you this weekend. Remove the wheel by removing the center cap and lug nuts as needed. Here's a photo of the whole front suspension for reference. We've removed the brake caliper and brake disc for another project. Just bend it straight and remove. Remove the large castle nut using a 7/16 closed end wrench. Use a 6 point wrench if you have one. 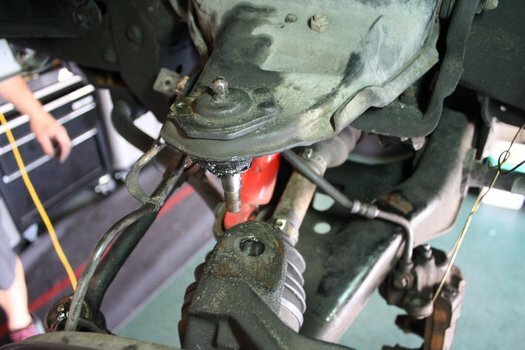 Loosen the ball joint from the steering spindle. Slide a pickle fork between the upper a-arm and spindle. The opening in the fork should slide around the ball joint shaft. We used a 3lb. mini sledge as it takes a good amount of force to loosen. Note that Pickle forks will destroy the ball joint's rubber boot most of the time. Make sure you have a new one. 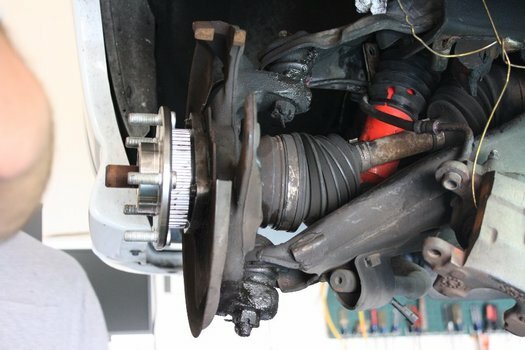 The upper ball joint is the easier of the two. The lower requires you to turn the wheels to have enough room for the pickle fork to work. 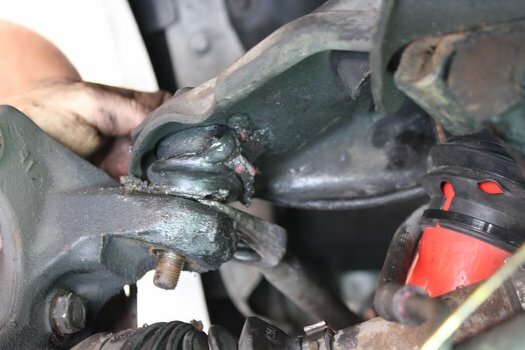 Remove the 4 fasteners that attach the ball joint to the A-Arm. From the factory - these are rivets. 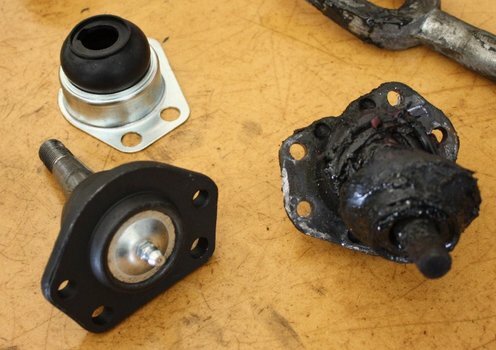 Most aftermarket ball joints come with bolts and nuts. If you're lucky, someone's already removed the rivets and you'll only need a wrench to remove them. If the rivets are still there, you'll need to get them out using a grinder or drill. Again, the upper ball joint is the easier of the two. Grinding out the rivets on the bottom is a little harder because there's more in the way. 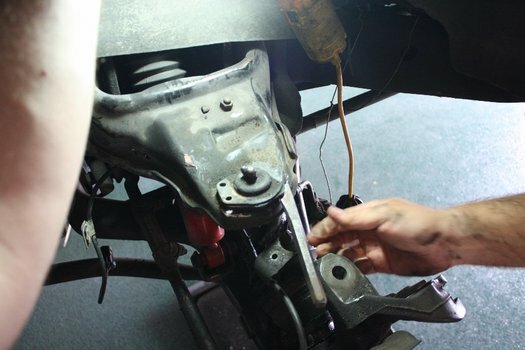 Remove the ball joint from the A-arm. Our's required a little bit of persuasion, thanks to those pesky rivets. Slide the new ball joint in place. The top and bottom ball joints rest on top of the A-Arm. Make sure you install the grease fitting if it isn't already installed. Tighten the 4 bolts to 17 ft-lbs.. Make sure the included nuts are lock nuts. You really don't want these bolts coming out. Slide ball joint into spindle and torque the castle nut. 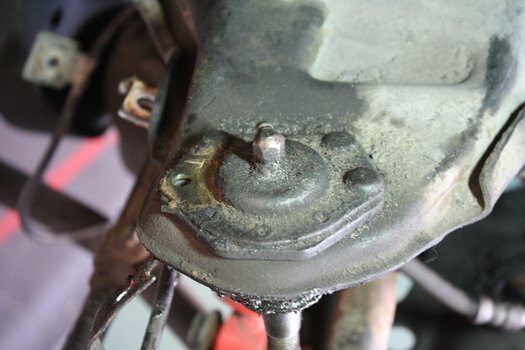 Install a new cotter pin to lock the nut in place. Fill the ball joint with grease. 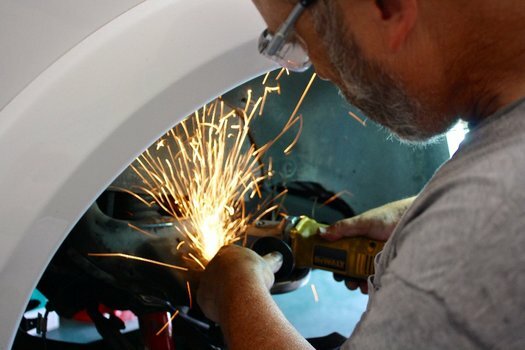 Once you're done, you'll probably want to get an alignment. 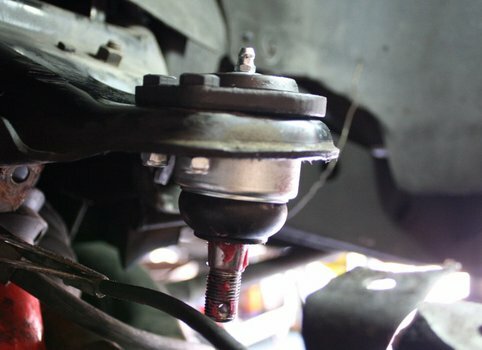 Changing small things in the suspension can place the components in different locations. Besides it'll get the most out of your new parts. Upper Ball Joint Center Pin: 61 ft-lbs. Lower Ball Joint Center Pin: 83 ft-lbs. Ball joint to A-Arm mounting bolts: 17 ft-lbs.